Choreographer and lead performer Kenrick ‘H20’ Sandy obviously doesn’t balk at a challenge. Kenrick, along with Blue Boy Entertainment has undertaken to turn this age old classic into a modern piece of accessible street dance theatre. Pied Piper at Stratford East is a hip hop street dance interpretation of Robert Browning (1888), Pied Piper of Hamlin. The streets are in disarray and plagued with rats represented in this piece as ‘hooded’ villains. The opening scenes are nothing short of electrifying as ‘hoodies’ climb on to the stage in a villainous intimidating fashion. 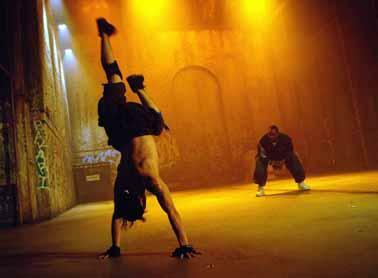 The dancers represent a sinister bunch in an exciting and bold mixture of contemporary street dance moves. As the story goes; the governors who are represented with huge white heads and long coats are at a lost and seek the assistance of the Pied Piper (Kenrick) to rid the street of the vermin for a price. When they fail to pay up, the Pied Piper seeks his revenge by entrancing the youth. The governors run away in disgrace leaving the Pied Piper to rule. The production is made up of 37 performers. The energy and commitment of the actors are so evident that it is virtually impossible to single out an individual performer. They perform as a group; a unified body that communicates to its audience with one unified voice. This could have become a repetitive showcase but the creativeness and comical timing of the performers brought drama to a dance production making it clear that this was a street dancing theatre production. There is no question that Stratford East has its finger firmly on the pulse of the local community and modern youth culture. The euphoric response from the audience clearly showed that not only was this piece a real crowd pleaser but the audience felt as though they could relate to the dancers. This is an edgy, hard piece of dance that is sure to open to door to a ‘hip hop dance revolution’. Who is this piece for? The Pied Piper is for anyone age 10+ who enjoys the 21 century MTV culture, likes loud music, dance and is looking for an accessible piece of theatre that the whole family can enjoy. If you are looking for a new message about the positive things our youth are up to today head to Stratford East. This is a sure fire hit! In the words of one of the young audience members the dancers were ‘clean’ (apparently that is great!). Jo Peart is The New Black Magazine's theatre expert. Pied Piper is presented by Boy Blue Entertainment. On for just 13 very special performances over 11 nights Times: Saturday 30 September - Saturday 14 October 2006, 7.30pm (except 14th October - see below) Matinee: 5pm, Saturday 14 October 2006 (Evening show on 14 October 2006 at 8.30pm). Prices: £10 & £16. Concessions are available for schools and children.